 no cutting or shaping required. 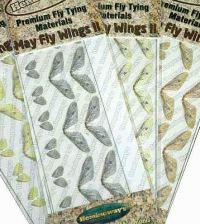 Realistic Mayfly wings. Straight. Pre formed, Pre Cut flexible, waterproof UV resistant. Thermostable.  Preshaped and precut  ready to use  no cutting or shaping required. HMG realistic wings. 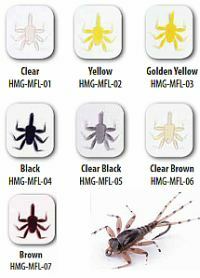 Pre-formed, pre-cut, flexible, transparent, hi-durable, waterproof and UV resistant. 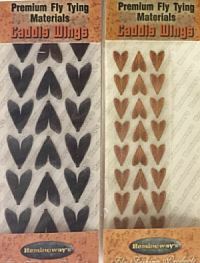 All of Hemingway's caddis wings are preformed, precut, flexible, translucent, UV resistant, water proof, and extremely durable. 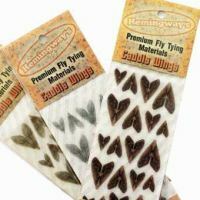 Hemingway's Realistic Stone Fly Wings are premium quality, pre-formed, pre-cut, flexible, durable, transparent, waterproof and UV resistant, all ready to use. Available in Extra Small (18 pieces, 16 hook size), Small (18 pieces, 14-16 hook size), Medium (15 pieces, 12-14 hook size) and Large (12 pieces, 8-10 hook size). 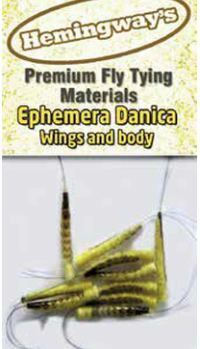 Authentic replicas of real blue bottle fly, crane, wasp and bee wings in their appearance and performance in the water. Made of top quality, lightweight, flexible and soft material. UV protected, strong, durable and resilient to tearing and scratching. 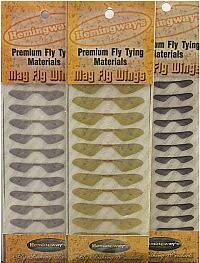 Pre-cut and easy to tie, no prep work needed  simply tie them on by the provided tab. 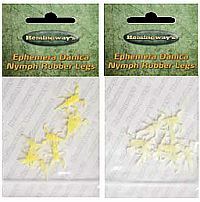 Carefully designed to prevent tippet twisting. Backs are like a hi-def, 3D copy of the top of a Mayfly nymph. 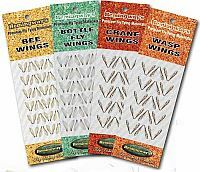 Made exclusively of a super realistic, self adhesive, extremely durable material that will have you convinced youre looking at parts from a real insect. 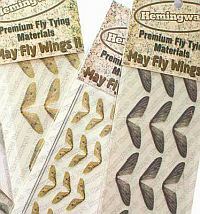 Hemingways Realistic Mayfly Nymph Legs are made to match all Mayfly clinger species. From the smallest to the largest you can copy what is present on the waters you fish. Mayfly nymphs are a large part of a fishes diet and we have matched them perfectly, profile, proportions, size, and color. 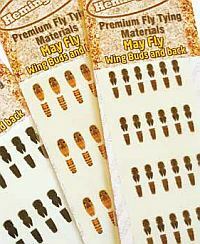 Coupled with our other Mayfly parts or just tied into your favorite pattern weve taken the guesswork out of it! 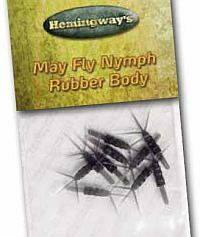 Hemingways Realistic Mayfly Nymph Bodies are made to match all Mayfly clinger species. From the smallest to the largest you can copy what is present on the waters you fish. Mayfly nymphs are a large part of a fishes diet and we have matched them perfectly, profile, proportions, size, and color. 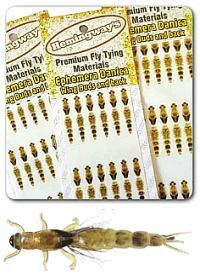 Coupled with our other Mayfly parts or just tied into your favorite pattern weve taken the guesswork out of it! 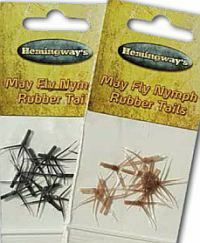 Hemingways Realistic Mayfly Tails are made using the same material and process as our other parts to give your flies that ultra real look, feel, and movement. 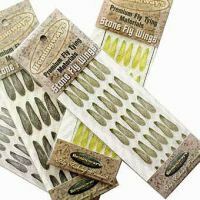 Whether tied into a pattern you have used for years or matched up with our other parts these tails will give you a superior overall look and an extremely natural feel on the surface or below it youll have a winner every time! 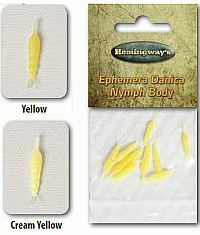 Hemingways Realistic E.danica nymph buds and back are built using the same process as our other nymph parts but represent a very different species of Mayfly nymphs which are known as burrowing nymphs. E.danica and other burrowing nymphs in the genius spend most of their time in their burrows well beneath the stream bed. They will only become available to fish at certain times like during a pre-hatch, or hatching situation. When these nymphs make themselves available the fish will exclusively key in on these nymphs and feast. 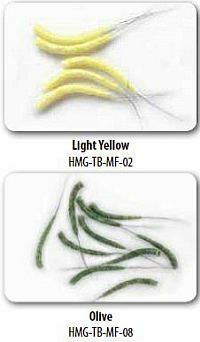 Which makes this pattern highly sought after and a must carry if you fish any waters where Green Drakes, Slate Drakes, Hex., Ect. may be living. Just like the duns hold on tight because you could be in the land of the giants before you even know it!